Kelp Queen Press, 9781771484053, 120pp. Why hello, dear reader. 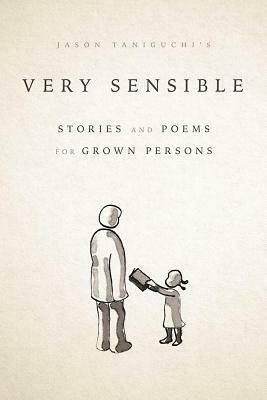 You have in your hands a copy of Jason Taniguchi's Very Sensible Stories and Poems for Grown Persons, which just may be the most singular artefact of our times. Yes, it contains some fine stories. Yes, it also provides some pleasing poetry. But that's not all: already there are powerful forces at work upon you. Depending on your genre proclivities, this may consist of a host of automated nanobots activated by the warmth of your touch and skittering from the spine of the book onto your unsuspecting fingertips; or dark eldritch creatures from the netherworld twining their bony fingers around your spirit; or tiny invisible fairies flittering just above the typeface, pointing their little wands right at you; or, for you genre-mashing fans, perhaps tiny invisible fairies ordering dark eldritch creatures to unleash a host of automated nanobots, probably by means of some sort of steampunky device with gears and pistons and even a primitive sort of spell-check. Regardless, these forces are even now meddling with your mind, nudging your neurons, sidling up to your spirit, so that you are saying to yourself, "Hmm This looks like just the sort of unconventional book I've been looking for A quick flip through the contents suggests that it consists of a delightful m lange of strikingly captivating stories, astonishingly accessible poems, and some sort of fantastical-mystical-technological device that makes me want to buy it Well, say no more--you had me at 'fantastical-mystical-technological device that makes me want to buy it' "
These are stories and poems. You are a grown person. Why not do the sensible thing? Jason Taniguchi is so impressed by you. Just look at everything you've accomplished, all that you've achieved. How do you do it? Have you taken one of those Time Management seminars? Do you delegate? Meanwhile, the months and years have dropped off the calendar like a montage of all the movies that have ever shown pages dropping off a calendar, and here Jason Taniguchi has been, frittering away his time, despite having no real idea what the frittering of time actually consists of--having never, for example, set aside so much as a single hour for the intended purpose of fritterance. Still, just look at them: all those years, good and frittered. But at least he has somehow managed to produce this slim volume, so that's something. He lives in Toronto with his wife and two children. He has waited his whole life to be able to say something like that in an author's bio, and no one is more astonished than him that it is actually true. He lives in Toronto with his wife and two children, and that is awesome. Guess that's what all that frittering was about. That, and watching all those movies.